As recently as last Wednesday, Gov. Peter Shumlin was assuring Vermont reporters at his weekly press conference that he was just too busy "creating jobs and doing the job [he] was hired to do" to wade into election year politics. "I think we'll have plenty of time for silly season after Labor Day," he said. But the Green Mountain gov managed to carve out some time over the weekend for a little partisan politicking at the annual meeting of the National Governors Association in Williamsburg, Va., where he continued auditioning for the role of Democratic Party message maestro. Though just a year and a half into his first term, Shumlin appears to be chairman-in-waiting of the Democratic Governors Association, a position whose principal responsibilities include bringing in the bucks and talking smack about the GOP. On Mitt Romney's Tax Returns: Shumlin and his fellow Ds "came armed with their Obama campaign talking points," ABC News reported, arguing that Republican presidential candidate Mitt Romney ought to publicly release more than just his 2010 tax return and an estimate for 2011. "I've never run for president, my daddy's never run for president," Shumlin told ABC, noting that Romney's father released a dozen years' worth of tax returns when he ran for president in 1968. "But if my daddy did run for president and I ran for president, I'd do what my daddy did." For the record, the story quotes Shummy using the word "daddy" four times. On Economic Mischief-Making by the GOP: "Democratic governors are accusing House Republicans of deliberately sabotaging the economy to help Mitt Romney oust President Barack Obama," the AP reported after interviewing a slew of Ds on the sidelines of the NGA meeting. Among them: Shumlin. "You have to ask the obvious question: How desperate and how far will they go to ensure this president gets defeated?" he said. On Advice for the President: "Democratic governors have a message for President Barack Obama: A lot of his economic rhetoric still isn't catching, and he's leaving out key points that could help," Politico reported. One of 10 Democratic governors interviewed for the story, Shumlin called Obama's unwillingness to tout the successes of the 2009 Recovery Act "a mistake." The so-called "stimulus" — particularly its investment in public infrastructure — has "helped to save the little state of Vermont from a really desperate economic situation," Shumlin told Politico. "There's just no doubt about it." On the Spinelessness of Politicians: Press coverage of the Williamsburg confab focused on governors' divergent reactions to last month's Supreme Court decision largely upholding the Affordable Care Act, but allowing states to opt out of expanding Medicaid coverage. Though the federal government would pick up most of the tab for expanding coverage to more low-income Americans, several Republican governors have said, "Thanks, but no thanks." 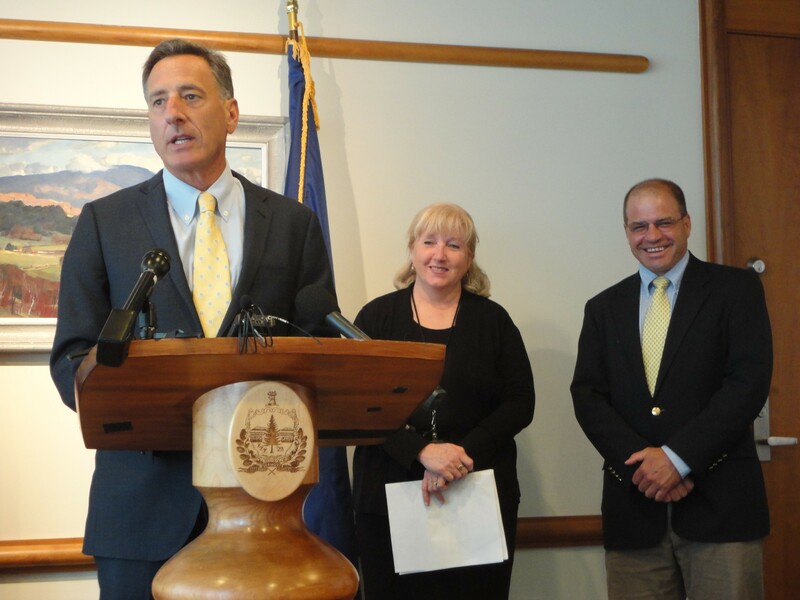 Worse than them, Shumlin argued at a DGA-organized press conference, are the GOP govs who rail against the health care law but won't divulge until after November whether they'll accept the Medicaid money from the feds, Capitol Public Radio reported. "Have a spine. The American people are sick and tired of spineless politicians," Shumlin said. "To say, 'I'm going to criticize the plan, but I won't tell you whether I'm taking the loot or not until after the election,' that's what breeds cynicism among the American people." On Putting One's Foot in One's Mouth: Shortly after Shumlin made the "spineless" call, the New York Times reported, fellow Democratic governor John Hickenlooper of Colorado showed up to the press conference and indicated that he too was on the fence about whether to take the loot. "We are evaluating that," Hickenlooper said. Shumlin's reaction? "I believe my comments should apply to every governor in the nation, on a bipartisan basis," he said, according to the Associated Press. Whoops!